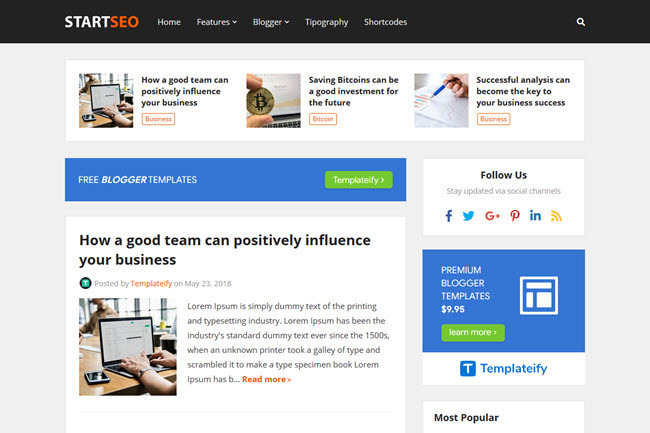 StartSeo is a powerful and professional blogger template, fully optimized for your blog to load as quickly possible. StartSeo also has strategic ad slots to boost your earnings. Also provided with a several custom gadgets and options for edit backgrounds, colors, widths and more. Mega Menu by (Recent or Label). GooglePageSpeed 100% - Check it. GTmetrix 93% - Latest Performance Report. Mobile Friendly Yes - Check it. Video Tutorial - How to Install and Setup StartSeo Blogger Template.